There were no Titsa news for its Tenerife buses advertised at the Puerto de la Cruz bus station in April 2018. That's when I bought a new Bono Card for Euro 30. Shortly after, a native woman by a Longuera Titsa bus stop introduced me to her absolutely different new card. It was the Tenmás card. But, the lady still had to learn much about it. Fortunately, the driver was patient, as one must know how to hold the card by the bottom of the machine. I find it works best when I press the card against the machine. Tenerife buses' modern Titsa Guagua that even takes you to tiny, remote hamlets like the depicted vehicle whose front reads Chamorga of the Anaga Mountains. Normally the green and white autobuses are much bigger but don't have a second story either. I just discovered a poster that was attached near a Titsa bus door in Puerto de la Cruz. It said that the Bonous cards made of paper won't be valid any more after September 03, 2018. It was suggested that you may exchange your old Bonobus card for a Tenmas card at any Titsa bus station. Click on the photo for more info about "Bye Bye Bonobus". 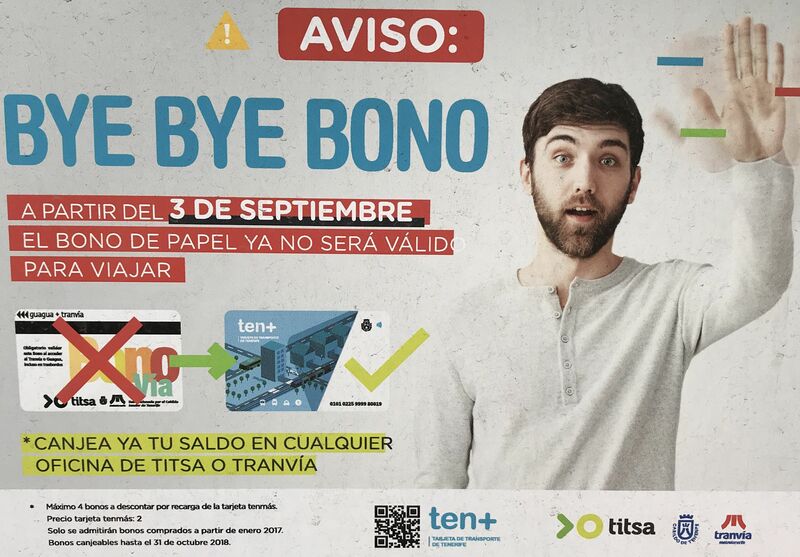 New Tenmas for a Bono card and how to go about it Titsa poster, as seen today on a bus. It says on the poster in small print that a maximum of four Bono cards can be traded in. The price of the Tenmas is Euro 2. Bono cards bought before January 2017 are not valid for exchange. You can't swap them after October 31 of 2018. Question: Where can I get a Tenmas card and what does it cost? Answer: You get it at all Titsa offices, Tranvia Metro-Counters and petrol stations at a price of Euro 2 without IGIC or any extra tax to pay. You cannot apply for it online any more but you may now get it at the shop called "Prepay" at the Tenerife South Airport according to the online Titsa information department. Question: Why would i lose out doing short trips with my old Bono card now? Answer: Actually now, I know better. I wouldn't lose anything. Contrary to what the lady had told me, there are no cheap short distances from one bus stop to the next that might be less than a km. It works like with taxis like with a minimum charge no matter how short the track. I came to realize that using the Guaguas isn't cheaper now. On the other hand , they are much more on time now by bus stops. That gives us, as so often two sides to the coin. Right now, drivers are definitely more stressed in all kinds of ways with the new system. Question: Is there a different price for tourists and local residents? Answer: no, it's the same price. Question: Will the card expire, as is the case with bank credit cards? Answer: No it wont become invalid for time being but may get damaged. In fact, the Titsa Tenmás Video says that it is "Para Siempre" which means for always. Question: What about a protective cover card? Answer: Mind only sellers at bus stations have protective covers for TenMas cards you buy there, contrary to other locations. Question: Is the card for one person only? Answer: No, It is for more than one. However, you must tell the bus driver how many are in your group or family. Then, he will program the machine to register accordingly. Otherwise, you shall get "invalido" for invalid action popping up on the machine. But remember to only swipe the card once at the exit, no matter for how big a group it has been used for. Question: What are the credit amount options for a TenMás card? Answer: Any amount from Euro 5 up to Euro 100 is permitted. Question: Why has part of a number been blocked out on the bottom right in the photo underneath? Tenerife Titsa electronic payment card TenMas with partly hidden number. Question: What is different with Tranvias? Answer: No cash payments to a driver are possible, at all. 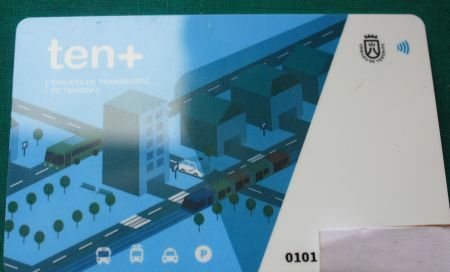 Hence, you can't pay what your card Saldo (credit balance) is short of in cash to a driver, which can be seen while you enter the Tranvia contrary to Guaguas where a saldo is only shown by a machine when you exit the bus. 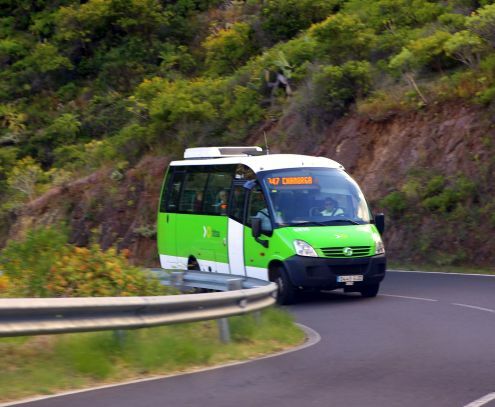 In fact, you can still pay cash for a Tenerife bus fare, while you may score a 10 % discount on two ways round trips that are 21km or more during one day. Question: How far can you travel in kilometers per day by Titsa Tenerife buses with the Tenmas card? Answer: As many as you like. Question: Are there any custom Bono cards still around? Answer: Yes, there are various, except the old Bono Via and you must apply for them at Titsa offices. However, I could not see anything that would suit a tourist who would like to drive to different places, sometimes even in a single day. There is a new card only for residents for Euro 47 which is valid for one month a ten point guide for which find here. Then, there's also a monthly resident pensioner card for those that are 65 years or older. You can travel into any direction with any of those cards and can go back and forth in one day as much as you want, but proof of permanent residence is required. These cards are not transferable, but are valid for all Canary Islands and Tranvias. They can't be used for the Teide bus or to the Faro de Teno, just like the Tenmas card. Children under the age of ten travel for free with Titsa. Question: Is this blue and white Tenmás card water proof? Answer: It looks like it is but may not tolerate saltwater of the ocean. Question: Where can I find out how much credit is left on any of my cards besides online or by reading the machine when I leave a bus? Answer: You can ask at a Titsa information counter. In Tranvias, you can also check the saldo on the machine when you enter. Question: Where get a free card? Answer: Not any more. The offer stopped on May 31 of 2018. Question: Where buy credit for the Tenmas card? Answer: At the Tenerife South airport, at Titsa and Tranvia offices as well as online by a link by scrolling down. It's said that also Petrol stations will handle Tenmas card credit for Titsa buses. Mind this is like when you top up your mobile telephone speak time. Most Kioskos and Estancos may sell it in major towns in the future. Lately I bought credit at a sweet shop and was charged a 20 cent fee. By the looks of it, some which sold the card stopped doing so. Question: Can I use newly charged cards straight away? No, you have to wait 6-8 hours. Hence never wait until all credit on them is used up. How travel even cheaper with Titsa by minding Traslado route changes with the Tenmas card?